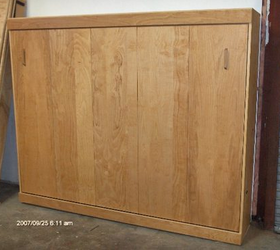 Available in Birch or Oak Side Panel bed with SOFT CLOSE GAS SPRINGS. Some of the wood parts are numbered and are pre drilled. The 1x2 supports that become the bed frame need to be countersunk by the installer. There are a few supplies that will be needed: a battery operated screw gun, 6 inch #2 square driver, countersink, 7/16 inch wrench, Allen wrenches, tight bond glue. 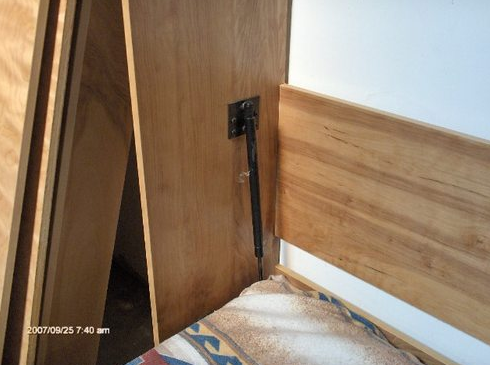 Liquid nails, clamps and a stud finder. All of these items can be purchased from a local hardware store.We include a pictorial assembly and installation manual that is very comprehensive,plus you can call for personal attention if you are having difficulties.All wood parts are held together by wide thread pocket screws, it is very easy to assemble if the instructions are followed in sequence. The size of this bed is 85 inches wide by 60 inches high by 16 inches deep.This bed will hold up to a 9 inch deep mattress. 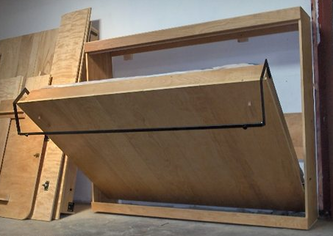 The bed folds out into the room 43 inches. 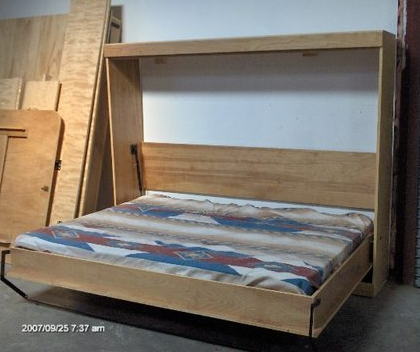 The total weight of the bed is 189 pounds. This is one of the most useful products you will ever own, it saves space and that's money.We at Bergman Woodworkers offer a unconditional guarantee, if you are not satisfied with our product within seven days pay the shipping and we will give you your money back. The shipping cost is about $250.00 Fed-Ex ground in the contiguous United States.. There are three boxes of about 70 lbs per box, Please call 505-286-0856 if you have any questions.
. We get 1/2 down balance at date of shipping with a check or Pay-Pal. Fill out CONTACT tab and we will get back to you. Shipping is about $250.00 depending on your location in the Country.